Jim, Mike and I had very similar interests in music including Judas Priest, Iron Maiden, Black Sabbath and UFO, and thrash/speed metal bands like Metallica, Anthrax and Slayer, however "Knightmare II" was going in more of a "Twisted Sister" direction, which we weren't really into. In late 1985 "Knightmare II" fell apart and we all left with the intention to form a band with these "British Metal/Thrash Metal" styles in mind. Around this time Mark joined the Navy so Mike, Jim and I jammed in Mike's garage while looking for a bassist. We were playing covers and a few of the songs me and Jim had written in 1984 before "Knightmare II" including "Asylum" and "Fear The Fire". The name "ATTAXE" was suggested to me sort of as a joke by my cousin Phil Merwin (Dirt Clod Fight) and I sketched out a logo design using the double sword idea. When I offered it as a name for our new band everyone thought it would be a good band name so we went with it. Not much more thought was really put into it at that time. We just needed a name and that was it. I was referred by a friend to Gary Sebourn who I had gone to Brea-Olinda High School with but I didn't know he was playing bass. He immediately fit the bill with an aggressive "Steve Harris" playing style (not to mention his "madman" look - he reminded me in some ways of Cliff Burton). It was mid-March because I remember that "Master of Puppets" had just been released (3/4/86) and Gary hadn't heard it yet so we gathered at my house to give it a listen. We placed an ad in "The Recycler" for a vocalist and after several auditions Mike White was hired and we moved into a rehearsal space located at the corner of Gilbert & Commonwealth in Fullerton, CA (now a lawnmower repair shop). After only a couple of months we decided to find our own rehearsal studio so my Dad helped us find an industrial space in Brea, CA which we spent the summer soundproofing. This would be our home for many years and became known as the "Unit G" studio which we shared with several bands including "Comatose" (Brian Kelly, Jim O'brien, Ron McGinnis, Barry Martin), "Armed & Dangerous" (Darren Porter, Greg Yarber, Larry Taylor, Brian Nussel, Dennis Campton), "Roadhouse" (Steve Houle, Joey Smith), "Cheap Wine" (Steve Houle), "Closing Speed" (Jim Mulligan), Aversion (Chris Fuhrer) and a few others I can't remember. Our setlist included several covers at this time. Some of the covers were "Rapid Fire" by Judas Priest, "Iron Maiden" and "The Trooper" by Iron Maiden and later we did "Whiplash", "For Whom The Bell Tolls" and "Creeping Death" by Metallica as well as "Ton Of Bricks" by Metal Church. Our early style was heavily influenced by Iron Maiden's 2 guitar harmony sound and by local band "Leatherwolf" who had gone one farther with a 3 guitar harmony sound. Mike White's vocal style was a little like Rob Halford's, so the Judas Priest influence showed as well. Big John's was a pool hall located on Orangethorpe Avenue next to the railroad tracks - lots of pool tables and a bar, with a tiny stage at one end. 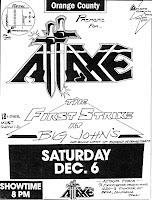 This first ATTAXE flyer was drawn by John Hoyt who also drew the first ATTAXE logo based on my original concept, and also produced the first ATTAXE T-shirts. This site chronicles the history of ATTAXE as I remember it, along with the help of many others including Mike Bonaventura, Jim Houle, Tim "Skelly" Cason, Gary Sebourn, John Fossum, Jerry Allen, Joe Smith and Bryan Stavis. Enjoy!